"you might be a king or a little street sweeper…"
I have never been much of a Sinatra fan, although I have always admired his voice. I’m sure most people have heard of him or heard him before so let’s not go into any of that. 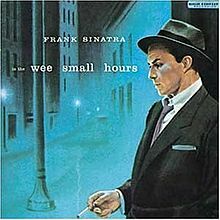 This album, In the Wee Small Hours (1955) is, and I think would be, enjoyable to hear. It’s smooth and has a touch of class, just like the mythos of Sinatra. Like I’ve mentioned before I am not involved in music in any way, therefore nothing I am about to say will sound technical. With that out of the way, there is a great overall mood to this album. The article written in the 1001 Albums… mentions that this was Sinatra’s come back. People thought he was done however, with this collection, Frank became big time again. The mood adds to that come back. It is a sensual Sinatra that I feel is missing from a lot of the popular songs of his that I have heard. With the opening track, “In the Wee Small Hours of the Morning,” there is a longing that is evident in elongated syllables he belts out with tact. Actually, there is a lot of longing in this album. In “Last Night When We Were Young,” it feels like Sinatra is reminiscing about his previous heyday, even though he sings about a woman. The song starts off nice and slow, like most of the songs on this album, but builds up at certain parts to emphasis what was there. The main feeling I get from hearing In the Wee Small Hours is that Sinatra is singing because he can, not for any other motive. It does not feel like he is trying to make a comeback, but enjoying the chance that was given to him. According to the book, this album did bring him back into the spotlight. He rejuvenated his career with these tunes. One of the more playful songs, to me, is “Can’t We Be Friends?”, which is ironic because it is about him being rejected. Rather than keeping with the somber mood of the majority of the songs on this album, this song has a nice, slightly more uptempo piano accompanying Sinatra’s usual spot-on tone. All in all, I would say I am pleasantly surprised with this album. I would definitely listen to it again, which I am doing now.